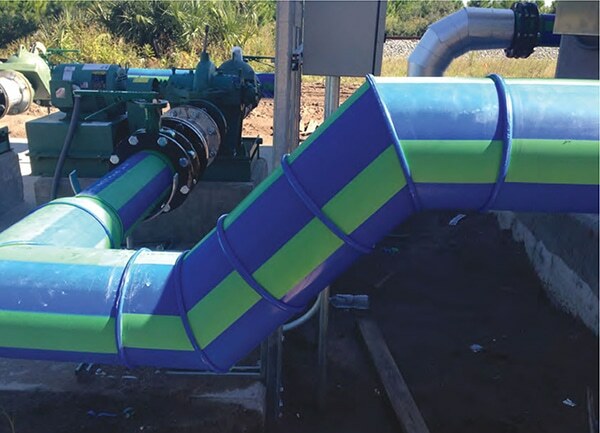 The mechanical contractor chose Aquatherm polypropylene-random (PP-R) piping because its potential labor savings and natural insulation properties were greater than any offered by traditional materials. "I was glad to accept Aquatherm piping as the piping material to be used for the traditional piping systems." Aquatherm piping’s potential labor savings and natural insulation properties were greater than any offered by traditional materials. Aquatherm’s Quick Check Estimator helped the mechanical contractor calculate labor savings using Aquatherm vs. traditional materials pre-installation. 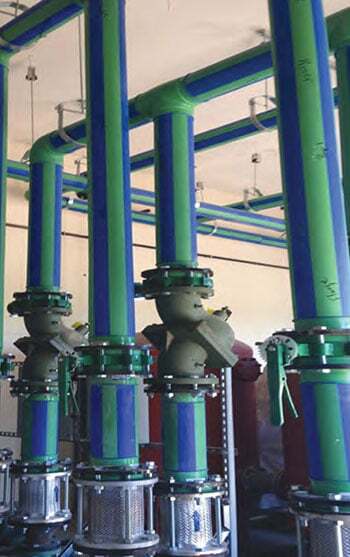 Aquatherm piping’s interior and exterior corrosion resistance staved off the negative effects of the aggressive local water. A new $12 million health and human services center needed a high-quality HVAC system to help ensure the health and safety of its vulnerable clientele. When St. Johns County’s old health and human services building— previously the Flagler West Hospital—in St. Augustine, FL, reached the end of its useful life, the county commission “could’ve put $4.5 million worth of Band-Aids on the building or invested in a brand new facility, and chose the latter,” said St. Johns County Commissioner Rachael Bennett. Former St. Johns County Commissioner, now state Rep. Cyndi Stevenson called the 1960s structure “an energy hog,” while a staff report called it “functionally obsolete.” Even if brought up to code, the aged complex still would have needed major continual maintenance. Instead, county commissioners cut the ribbon on the new, relocated St. Johns County Health Center in February 2015. The completed construction on the 75,000 sq. ft. building cost approximately $12 million to build, $8 million of which came from the sale of the old property to Lowe’s Home Improvement. The center houses at least five St. Johns County agencies: Mental Health Services, the Florida Department of Health, the Department of Children and Families, Veterans Services, and the Family Integrity Program. One of the many problems with the old structure was its inefficient HVAC system.Health and human services centers typically assist the most vulnerable community members. According to the U.S. Environmental Protection Agency, building materials can have a major impact on air quality and can markedly affect occupants, especially the most susceptible of the population, such as children and the elderly. Careful material selection along with proper operation and maintenance can help improve air quality. Therefore, choosing proper building supplies for St. Johns County Health Center’s HVAC system was imperative, right down to the piping system. McVeigh & Mangum Engineering Inc. (MME), partnered with PQH Architects Inc., both of Jacksonville, FL, to provide the total architectural/engineering designs for the new health and human services center. MME provided the mechanical, plumbing, electrical, and structural designs for the project. The building’s HVAC system receives chilled water from two water-cooled chillers and two cooling towers. The chilled- and condenser-water systems originally were specified with steel and copper or polypropylene-random (PP-R) piping. The installing mechanical contractor, AC General, Jacksonville, FL, chose PP-R piping as an alternative material to steel because of its potential labor savings and natural insulation properties. Aquatherm Blue Pipe® is engineered to be a superior alternative to metal and other thermoplastics. Designed for heating and cooling, compressed air, and industrial applications, the PP-R pressure piping system offers longevity and ongoing performance without corroding or weakening over time. Its multi-layer faser (MF) technology reduces linear expansion and contraction and reinforces the pipe, improving impact resistance. Blue Pipe with MF technology is extruded with a middle glass fiber layer that reduces expansion by 75% compared with other thermoplastics. The MF layer does not require any modifications to the heat-fusion joining process; therefore, installations remain secure and require fewer supports. Aquatherm PP-R piping systems use reliable heat fusion to form connections; heat fusion bonds both sides of a joint into a single, homogenous material without the use of chemicals, adhesives, or mechanical connections, which eliminates systematic weaknesses and potential fail-points in the pipe. The seamless heat-fusion connections, combined with the piping’s resistance to corrosion and abrasion, help to ease leakage concerns. According to Jeff Mock, PE, Senior Mechanical Engineer with MME, Aquatherm piping systems were included in the bid because their potential labor and insulation savings were greater than any offered by traditional materials. Additionally, MME had good experiences using Aquatherm PP-R piping for chilled-water systems on previous projects. “Aquatherm had published labor rates and estimating software [the Aquatherm Quick Check Estimator] that allowed us to calculate labor savings pre-installation,” said Marty Bryant, Project Manager, AC General. Lifespan and integrity also were key to Aquatherm’s specification. Aquatherm PP-R piping systems are hydrophobic, repelling water from their surfaces. This protects the pipe walls from erosion and reduces leakage concerns. The smooth, chemically inert material prevents scaling and corrosion buildup, so the piping systems’ performance never suffers, even without chemical treatment. Aquatherm PP-R piping’s corrosion resistance—both on the inside and outside of the pipe—was a driving factor for allowing its use on the project. The local water quality is extremely hard on steel and copper piping, and the St. Johns County Public Health Department service personnel wanted chilled and condenser-water systems that would be as resistant to the aggressive water as possible. “The quality of water is concerning, so we needed a piping solution that was corrosion-resistant and would fit in our budget,” Bryant said. Even though MME had installed Aquatherm PP-R piping systems before, AC General had not. And as a first-time user, the mechanical contractor had some reservations about installing Aquatherm, but with guidance from Glen D. Drummond, Jr., Product Manager, Florida & International, Commercial Business Group, Ferguson Enterprises, a plumbing wholesaler, any learning-curve jitters soon were allayed. Also, because Aquatherm PP-R piping systems were approved in the specifications as a bid substitution, Bryant submitted the Aquatherm chilled- and condenser-water systems for approval and obtained it.